The Montreal Children’s Hospital (MCH) of the McGill University Health Centre (MUHC) and McGill University Faculty of Medicine are proud to announce that Dr. Pramod Puligandla has been elected to the Pediatric Surgery Board of the American Board of Surgery. Over the next six years, he will participate in defining and setting the standards for certifying specialists in pediatric surgery across North America. He is also the first pediatric surgeon from Canada to ever be elected to this position. Dr. Gerald Fried, chairman of the Department of Surgery at McGill University, believes this appointment is a reflection of the respect and admiration for Dr. Puligandla both nationally and internationally. “Having a seat on their Board allows him to contribute to setting a standard of practice that ensures graduating pediatric surgeons have obtained all the competencies to practice their specialty safely,” he says. Dr. Erik Skarsgard, president of The Canadian Association of Pediatric Surgeons and surgeon-in-chief at BC Children's Hospital, says it is wonderful to see Dr. Puligandla's leadership in surgical education in Canada recognized. “Pramod has been a visionary innovator in surgical education for the past decade, and will bring wisdom, collaboration and the Canadian perspective to the Board at a critical stage of policy development related to education and maintenance of competence for North American pediatric surgeons,” he says. Dr. Puligandla is a full professor of Pediatric Surgery, Pediatrics and Surgery at McGill University. He is also associate chair for Perioperative Services in the Department of Pediatric Surgery. Born in Kamsack, Saskatchewan, and raised in Edmonton, Alberta, the self-proclaimed “prairie boy” earned his medical degree from the University of Western Ontario, where he also completed his general surgery residency and Masters degree in physiology. 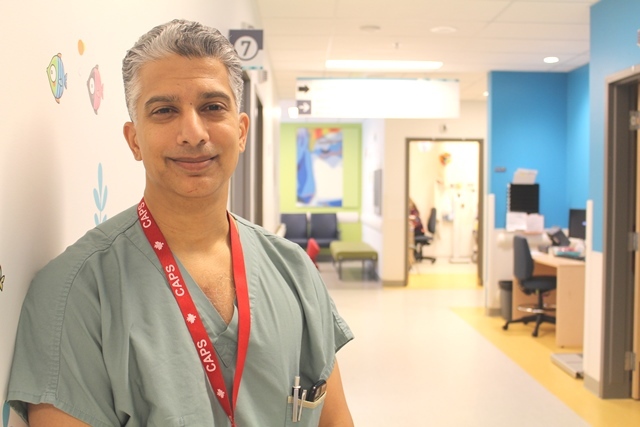 He went on to complete a pediatric surgery fellowship and pediatric critical care fellowship at McGill University and has been working in pediatric surgery and pediatric intensive care at the Montreal Children’s Hospital since 2003. He is also a member of the Royal College of Physicians and Surgeons of Canada’s Specialty Committee and Examination Board in Pediatric Surgery. The Montreal Children's Hospital (MCH) of the McGill University Health Centre (MUHC) is a tertiary care pediatric teaching hospital affiliated with McGill University. The MCH prides itself on providing patient and family-centered care. What makes the Children's unique is the true spirit of the hospital—a wonderful blend of caring, innovation, uncompromising standards, and dedication to public service that has characterized the institution since the beginning. Over the years, the hospital has become known for its wealth of expertise in various fields, particularly cardiology and cardiac surgery, trauma care, neurology and neurosurgery. For more information, visit thechildren.com. You can also follow the MCH on Twitter, Facebook and Instagram. Founded in 1829, the McGill Faculty of Medicine was the first faculty established at the University and the first medical faculty in Canada. Today, it comprises Medicine, the School of Physical and Occupational Therapy, the School of Communication Sciences and Disorders and the Ingram School of Nursing, in addition to a wide-range of departments, institutes and centres in the biomedical sciences, offering excellence in post-secondary education and research. Through the Réseau universitaire intégré de santé McGill, the Faculty of Medicine, together with its network of affiliated teaching hospitals and partners, is also responsible for coordinating access to training, research and health care for close to 1.8 million Quebecers across 63 per cent of the province’s landmass.